Cheesy grins, cheesy movies, cheesy cheese! Yums. Last night I went to a birthday party and brought a Mexican Quiche to snack on. I've never made it before so I was really nervous that I was going to accidentally feed my friends raw egg and then they would get some creepy egg-borne diseases. In the end it was fully cooked and stuffed with over 4 pounds of delicious cheese. As I've said before on this blog, I'm not exactly a chef so this recipe was simple enough for me to tackle. The quiche is really good for breakfast too! Lightly sautee the onion, pepper, and parsley with a little bit of the melted butter in a large frying pan, the veggies should still be crunchy. Add veggies/parsley and all the cottage cheese and 3 cups of grated cheeses. Some candid shots my friend took as I was getting ready to leave for the night! That quiche looks so yummy! I'll have to try it! Oh that quiche looks amazing. Must.Make. The Mexican quiche looks delicious and you look lovely! You are SO adorable! I absolutely love the color of your eyes. (: Sounds like you had a great time, I think I may need to make that quiche. I too, LOVE. CHEESE. this reminds me of that movie Une femme est une femme! Lovely jacket and amazing bag!!!! and love your vintage bag! that sounds delicious! and I love your coat! That bag is so cute! I love your coat too. Gorgeous outfit. Oh ma gaad your teethbrushing photo is so adorable! And you're rockin' those shorts again. They look great! that quiche looks so good i'm crying. I could eat cheese at every meal! Oh, I HAVE to try! I'm also a cheese lover! And your bag is PERFECT!!! Kallie you look so adorable! I love shorts and tights! I WANT THAT CHEESE, I mean quiche... nom. Did you cut your hair? It looks cute and flippy! mmm, i am going to try this... and add BACON! i am not very savvy in the kitchen either but, I will take your word for it and see how it goes by making one. your kitchen is the cutest thing i've ever seen. 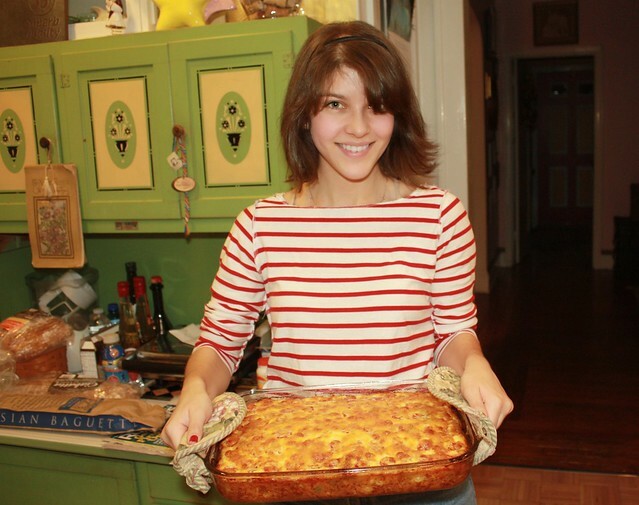 also- totally snatching your Quiche recipe! it looks delicious! anything with 4 pounds of cheese is guaranteed to be tasty. and you look adorable! youre face is made for television! Soo pretty! Wow you actually made teeth-brushing cute! 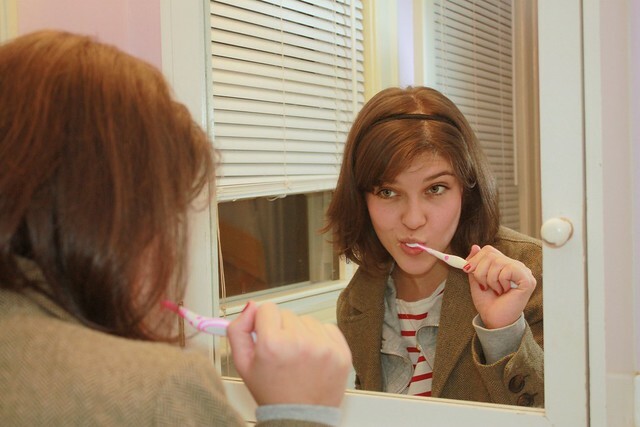 Congrats on that chica, because I just look like a rabid animal when I brush my teeth haha! That quiche looks so yummy, and I pretty much love anything with cheese! Also loving your striped shirt :). Your eyes.. it's like precious gems! :) And those Mexican quiche looks so yummy that I think I'll do a test run of the recipe on the weekend! 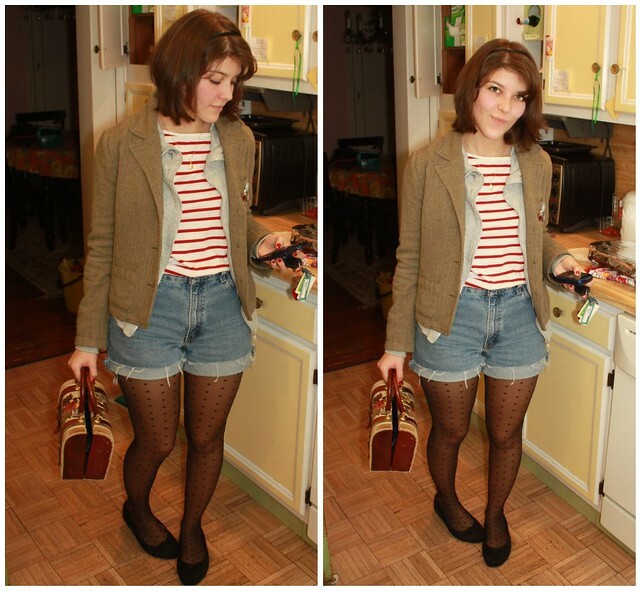 You look lovely, love the striped top and the shorts on you! I feel like I've got two things, an outfit and a delicious recipe, for the price of one!